Remember when I came to you, back in December, and asked you about the wall in your pods’ hallway with the empty cork strips? Remember when I asked you if the 4th grade team had any plans for them? And do you remember telling me that no, there were no plans because that space is usually left open for artwork? And remember how you excitedly invited me to hang up artwork? I was thrilled to have some display space, do you remember? My four sections of 4th grade students were working very hard on these beautiful drawings that I couldn’t wait to put on display. I knew space was limited, so I made sure to select pieces of work from each 4th grade class, this way, each group was represented fairly (truth be told, it was first-to-finish, first-to-be-displayed). I stayed late one night so I could get the work hung up before winter break. Everyone loved it. The principal came by my room and raved about the work. She even called it frameable. It really brightened up the hallway, a hallway that had previously been bare for three whole months. Now, imagine my shock when I arrived at school this morning and discovered every single one of the drawings gone. And in their place, I found a few illustrated writing pieces. As a side note, let me say, kudos to you for making an effort to display your students’ work. I think it’s great to show off the hard work and effort that went into the pieces. But, the thing is, don’t you think you could have checked with me before you took down the drawings? I would have been more than happy to have cleared the space for you (although, I’m not sure why it was necessary to remove all 30 pieces of work I had on display for the three overflow writing pieces that didn’t fit on the other wall where the rest of the essays were displayed. Seems to me you could have just taped those three up next to the rest, but what do I know, you know?). More importantly though, don’t you think you should have checked with me before you made the decision to send them all home? I suppose I shouldn’t blame you. I mean, how did you know they hadn’t been graded yet? And how would you have known that I wanted to keep some of the pieces for the art show? I mean, it’s not like we discussed it or anything, right? And yeah, I suppose I should have graded them before I displayed them, but the thing is, I’m only at your school two days a week, and with all the snow days and two-hour delays we’ve been having, those two days quickly turn in to a half day. As in, lately, I’ve been at your school for five hours a week. Shame on me for not getting them graded sooner. I should have known better. On second thought, the drawings were on display for an entire month, so I guess it was time to change it up, although with the two week winter break, you could argue that they weren’t even seen during that time, so it doesn’t really count… but, I don’t know if you noticed the pumpkin patch paintings and fall trees the other art teacher has on display downstairs? No one’s taken those down yet. Not to mention the self-portraits that have been on display since September. But, yeah, clearly my 4th graders’ drawings needed to come down. And like your colleague mentioned when I approached you about the missing work, I’m sure the students still have them at home. So, you know what? No biggie. In fact, than you for saving me the time it would have taken to remove the work myself. Not to mention the time it would have taken me to grade them. I really owe you one. 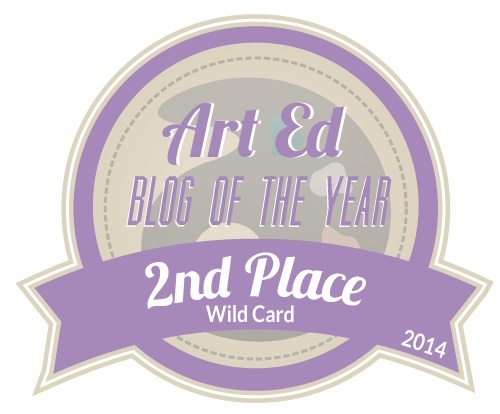 In case you’ve been living under a rock, the results of The Art of Education’s annual Art Ed Blog of the Year contest were announced last weekend. Thank you to everyone who voted. Art Teachers Hate Glitter came in second place in the Wild Card category! Without your support, I may have given up this endeavor long ago. Thank you. → Dem First Graders. Geesh. ← It’s an art room. Get over it. do your coworkers read your blog? I let out such a breath of condemnation when I got to “every single one of the drawings was gone.” that I had to verbalize to my husband that I was reading your blog. Asshat. That teacher is an asshat. Now, go ask her to have the students make a piece in HER classroom for the art show. Ugh. Bummer, dude. It’s times like these that I sometimes think that I could totally live on a deserted island with only me, my art room, the kids and No.One.Else. Sigh. I thought this was supposed to be a humorous blog. Nice … Very considerate … So helpful? So sorry that you are going through this. I totally get it and have had similar issues in my school. At least they usually ack me first. One year I did decided to do a Lascuax Cave installation. Every year since my board, I’m at a charter, has expected a new and bigger installation. Great right. However they take a month for the students to complete the work and several weeks for me to put up. I know I’m crazy. I have done a Frank stella sculpted wall and James Rizzi house installations. They look great. But just after the Frank Stella went up, I was ask to take it down. Seems house keeping foiund it inconvenient. Never mind that I had cleared the installation plans with my principal. I took them down and stayed a Saturday to reinstall them on adifferentl wall. Oh well. We do it for the kids. So it’s the same everywhere… “It’s only Art…” Like we don’t have a curriculum to teach, we don’t have grades to do, we don’t have SGOs to be accountable for… but if we are so dispensible, why is that when plans are made for field trips, meetings, etc their kids will NEVER miss a Special? God forbid they miss a minute of their PREP!!! I can soooo relate. I’m so sorry. Last week I noticed that two of my kids’ huge mandala artworks were missing from a display outside their classroom (where I had hung them from the ceiling during my limited release time). They represented about a month worth of work and the kids had put their whole hearts into them. They were lovely drawing/paintings about identity. When I asked the teacher where they had gone she said, “Mmm I saw them lying around and I think the cleaners put them in the rubbish” She DIDN”T EVEN SEND THEM HOME !!!! And guess who hadn’t photographed one of them? I had tried and it was blurry (for their portfolio) and so I was going to photograph it again, which is how I noticed it was missing. I’m so bummed. So, now one kid has no work to take home and nothing for the portfolio and I can’t even print off a photo of it for him. 😦 I could scream. Wow, can’t believe how many of us experience this! I always hope that it’s just the particular school I’m at and that “normal” elementary teachers wouldn’t be so mean. And I found it interesting that it was 4th grade for you, this year it was K & 1st grade teachers but last year the 4th grade teachers sent home a so-called art/social studies collaborative project that they had me begin and yet they (4th grade teachers) never followed through & had the students finish, just sent it home without my grading the art portion or having it on display/photos. Aargh – to scream or to sigh….. So relate. Note for next year…. tell my students not to take home artwork that hasn’t been given to them by ME and told by ME to take home. Then at least if I forget to tell other folks to give ME back the work that was on display or sent out for the fundraiser where parents and grandparents order the kid’s art on keychains and junk at least the students might keep it in their binder and say, Ms. Elle, did you want this for the art show? The art show just doesn’t appear out of thin air ya know!